Though the new Mercedes Benz Class C Coupe looks much like other coupes on the road it has one distinguishing aspect - the three-pointed Mercedes Benz logo in the center of the grill that indicates this vehicle comes from a 125-year dedication to advanced, comfortable and tech-savvy automobiles. The MY2012 Mercedes Benz Class-C Coupe will attend the debutante ball in Geneva Switzerland on March 1, a full six-months before her first appearance in American showrooms. We are using feminine pronouns because the Mercedes part of the brand name comes from a young progeny of Gottlieb Daimler. The cars are named after a woman rather than the other way around. 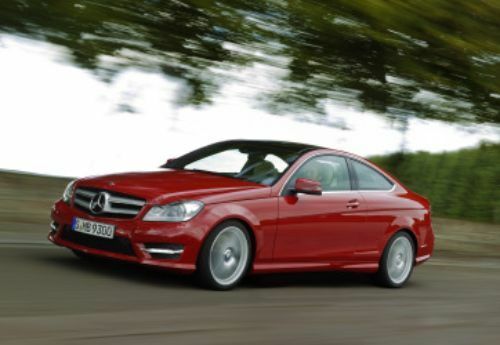 The coupe will come with either a 302 horsepower C350 engine or a 201 horsepower C250 engine. These are “packaged in a coupe design that combines pure driving fun with exemplary efficiency,” according to the press release. To our way of thinking the use of the term “efficiency” should be reserved for cars that develop a hundred horsepower or more per liter of engine. For example, the recently mentioned Lexus LFA pulls 552 horses out of a 4.8-liter engine. That is, of course, unless you are speaking of fuel efficiency – a different matter entirely. On the other hand, when we drove the C-350 sport a couple years ago, we found it a fun-to-drive, reasonably priced and much more than adequate way to get about. Consequently we will reserve judgment on the new coupe until we have had the opportunity for some time in the driver’s seat. In terms of technology the new model has some delightful new features. Shift paddles are one nice addition but phone book transfer, wireless Bluetooth audio streaming and a USB interface in the center armrest are not to be disdained. Nor is the integrated Sirius weather info, the ability to upload preplanned routes from your pc, plus the use of Google destination search capability and uploading personal destinations via an SD chip. The engines ARE fuel efficient getting a combined average of 22-mpg in the C350 and 27-mpg with the C250. Chances are that improves their emissions as well. Three link suspension with McPherson struts up front followed by a multi-link independent rear suspension with anti-roll promises a stable, agile tracking and cornering ride. In addition the C-Class Coupe has all the latest sensor and camera safety tech along with a comprehensive airbag system. Tech systems include Assistance systems at a glance: ABS, auto dimming headlamps, lane keeper, blind spot indicator, attention assist, electronic stability, Bi-Xenon headlights with active curve illumination and a parking assistant. In conclusion, by the time September rolls around, we’ll be anxious to this thoroughbred out for a run.